Merry Christmas!! 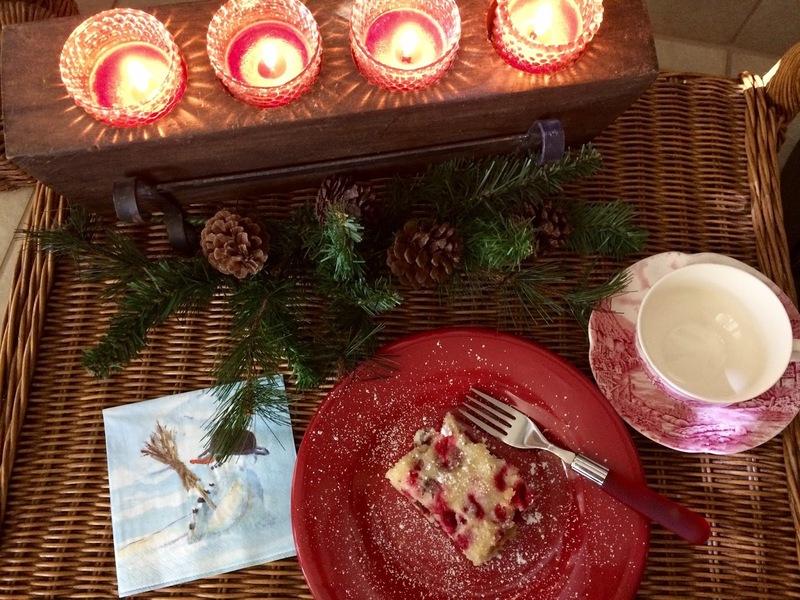 Let's share a slice of Cranberry Christmas Cake today, with a cup of Christmas Tea. I'm using my Johnson Brothers Olde English Countryside teacup. This cake can serve as a coffee cake or dessert. You could use a dollop of whipped cream or a sprinkling of powdered sugar. Spread in a buttered 9x13 pan. Bake for 40-50 minutes, or until very lightly browned and a toothpick inserted near the center of the cake comes out clean. Let cool completely before cutting into small slices. 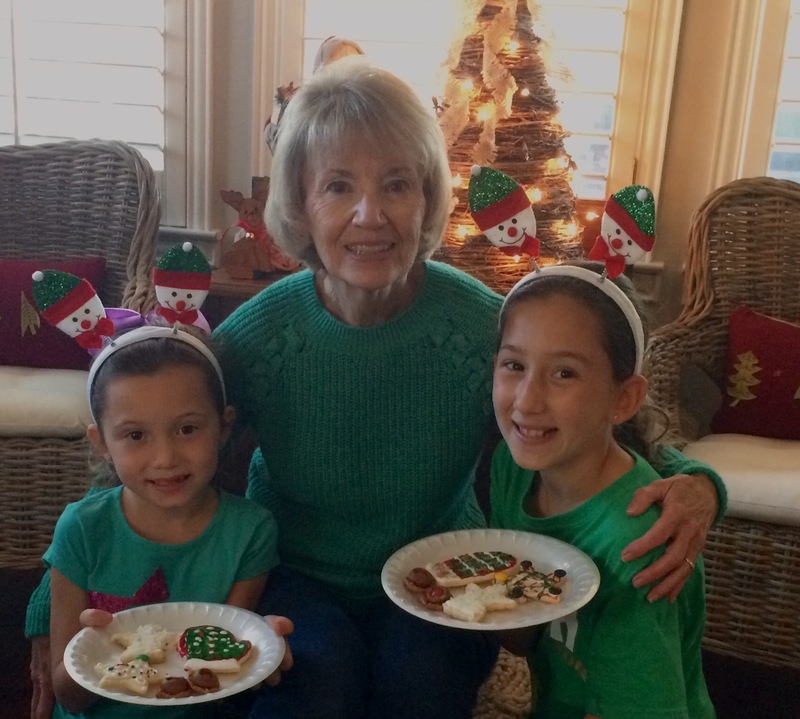 These two granddaughters came by the day before Christmas Eve for presents, lunch and cookie decorating. Didn't they do a great job? My other six grands spent Christmas Eve at my house. I always give them pj's and most of them change into them before they go home. We had lots of fun! Merry Christmas Blessings to each and every one of you! Merriest of Christmases to you, my sweet friend. Love and hugs. 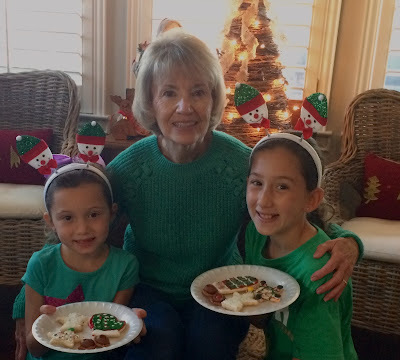 What adorable photos with your Grands!Your cake is mouthwatering,Kitty!Merry Christmas! I love your Christmas Eve tradition, Kitty. Merry Christmas to you! Hello Kitty, oh your cranberry bread sounds so good. It looks like you all had a great time. Merry Christmas and Happy New Year. Awww, it's Nana's Cooking Camp: Christmas Edition! Your grandkids are adorable. I like your PJ tradition. I have a weakness for cute PJs and always keep an eye out for PJs featuring dragons or ninjas for my godson. This year, I gifted him these super cute "ginga-bread" PJs! Gosh you all look so cute! Those grands are all going to be great bakers! It sounds like you had a wonderful Christmas with your family. Wishing you all the best in the New Year. Merry Christmas, Kitty! Your grandchildren are beautiful, and the cake looks yummy. Kitty that bread is just the most beautiful bread with it's burst of color! So fun that the grands spend the night! Half of our do and that is the best part - watching them be so excited. We take turns and the little five year old was so cute about waiting her turn, trying to figure out how soon she would have a turn again! Merry Merry Christmas! 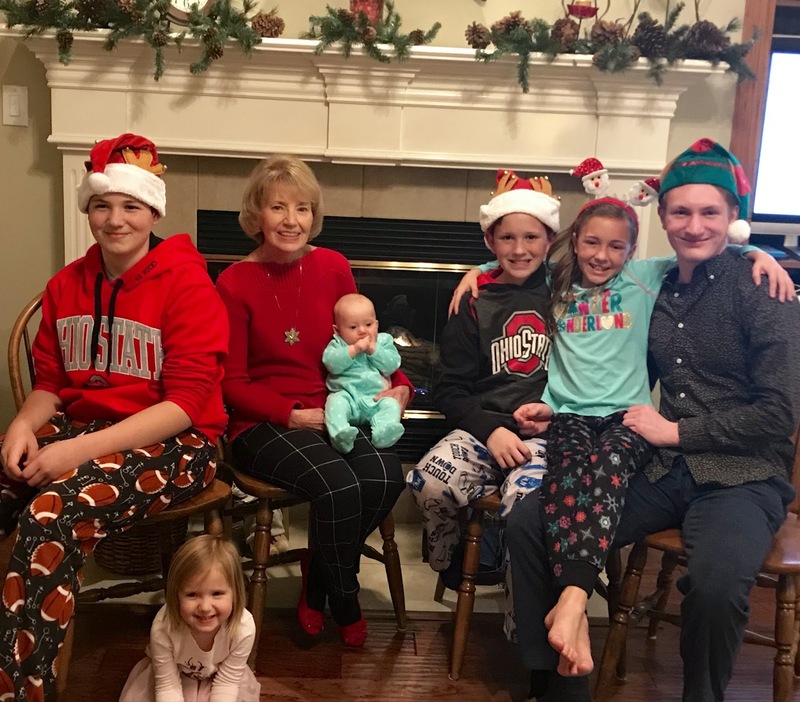 How sweet to buy your grands Christmas pajamas and that they come by and enjoy Christmas Eve with you. And that you have some coming earlier and decorating cookies. They will always remember those times. That cake/dessert looks delicious! I love cranberries. And, your Grans are so cute and what a good time on Christmas Eve. Happy 2018! Kitty, I love cranberries, so I'm definitely going to make this (though, of course, I will cut the sugar back to 1 1/2 cups - you know me!). 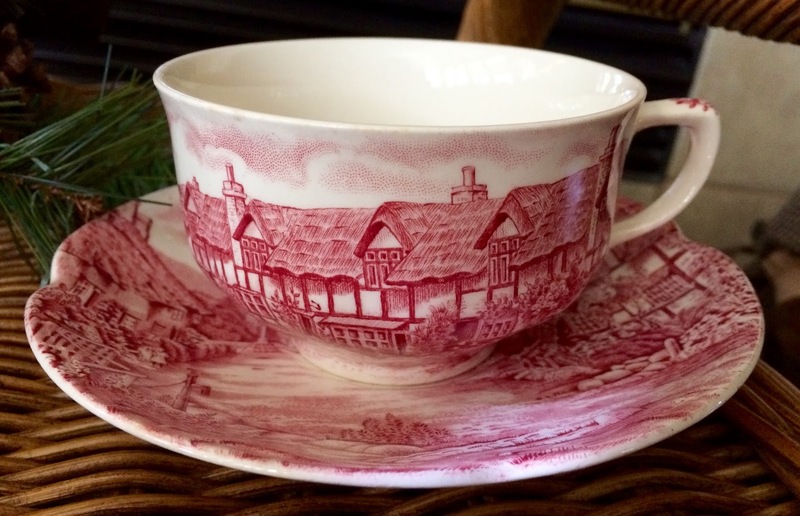 Looks so pretty on your Johnson Bros dishes. You have a lovely family! This cake looks amazing! Pinned. 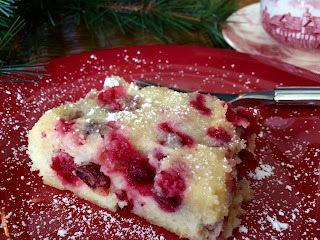 Kitty, I love all things cranberry and I know your cake must be delicious! What sweet photographs of you and the grandchildren! They look like they are enjoying their pajamas!! I love the picture of you with your grands (and love your tartan plaid pants). :D You're blessed with a big family, and the grandchildren look so sweet. Have a good weekend, Kitty.